It is now almost impossible to separate myth from reality with respect to Henri Jayer. It has almost become an existential domaine, as if Jayer never made mortal fermented grape juice. Prices are irrational, and yet the wealthiest wave blank chequebooks in the air at auction, feverish demand fuelled by the fact that fewer and fewer bottles will come onto market as time goes by. Domaine Henri Jayer is rarely seen. It is even more rarely consumed. I never met Henri Jayer and will always rue the rendezvous that never worked out. The closest I came was actually standing in Cros-Parantoux explaining the Premier Cru to my one year-old daughter at the very moment Jayer passed away. But I have spoken to those who knew him well. They paint a picture of a humble man who loved winemaking and chatting about his lifelong passion to likeminded people. He was extraordinarily generous whenever clients or winelovers visited. He knew his wine was good and perhaps presciently scurried what he regarded his best bottles and magnums away for his family. Is Henri Jayer the best vigneron who ever lived? Certainly, he is one of the greats although, interestingly, when discussing Jayer with those who worked with him, his practices would be considered an anathema to today’s winemaking ideals. Jayer was not averse to spraying his vineyard with chemicals whenever necessary. I still recall Jean-Marie Fourrier reminiscing about spraying Roundup in Jayer’s vineyard when a young stagière. Jayer routinely used 100% new oak when today’s trend is to dial it back and express terroir rather than the cooperage. But, having studied under René Engel, Jayer was one of the first to really care about viticulture when others strived towards quantity. He presciently de-stemmed when others would throw stems into the vat, lignified or not. He undertook comparatively long macerations when today all the talk is about “infusion”. The problem is that prices are so absurd that anyone opening a bottle expects the greatest red Burgundy ever, to the point where disappointment is almost inevitable. My own experience with Henri Jayer’s wines is extremely limited, probably a dozen bottles in my entire career. This Cellar Favorite focuses on his fabled Cros-Parantoux, the Premier Cru famously created by Jayer after the war, when he dynamited the limestone rock in order to plant vines. Though it has the loftiest cachet, fostered by location and rarity, Cros-Parantoux is not necessarily Jayer’s greatest wine. Mavens with far more experience that myself often cite Aux Brûlées as his most consistent cru. Cros-Parantoux comprises just 1.01 hectares just above Richebourg, now shared between Jayer’s nephew, Emmanuel Rouget, and Méo-Camuzet. It was a dinner in Hong Kong where we had already drank obscenely well, when post-prandial conversation veered towards Jayer. “Have you had many Henri Jayer?” asked the generous host. I shook my head. I must have had a forlorn expression on my face because without hesitation, he disappeared and returned five minutes later with a 1987 Vosne-Romanée Cros-Parantoux. Only in Hong Kong! The 1987 Vosne-Romanée Cros-Parantoux 1er Cru has a sensual bouquet that belies what was a mediocre growing season. Crushed strawberry mingles with rose petal, iron filings and a touch of sage and sorrel. The palate is medium-bodied, with a fine line of acidity. This feels very harmonious and surprisingly full in the mouth; yet the second half is tender rather than powerful, with a pretty, very pure, slightly tart finish. Bottles kept in ideal conditions will continue to drink well, though I cannot see any advantage on cellaring long-term. Tasted at Epure restaurant in Hong Kong. 93/Drink 2018-2028. I have only tasted two other vintages of Cros Parantoux. The 1993 Vosne-Romanée Cros-Parantoux 1er Cru was purchased off the list at La Gavroche in Mayfair, initially bought on release by Albert Roux at some incomprehensible small sum. I have been lucky enough to have this vintage two or three times now, since first my first encounter in January 2016. This bottle is almost exactly the same as the last, which is unsurprising. It has a very intense bouquet that is so perfumed and intoxicating that your senses are immediately seduced – predominantly red fruit, mulberry and pressed flowers, perhaps this a touch more violet than iris. The palate has a satin-like texture, mineral-driven and, perhaps, less understated than many 1993 red Burgundies are these days. The finish has a sense of piquancy and displays exquisite delineation, not to mention extraordinary length. To taste this wine once was a privilege. Twice makes me almost feel guilty…almost. 98/Drink 2018-2030. 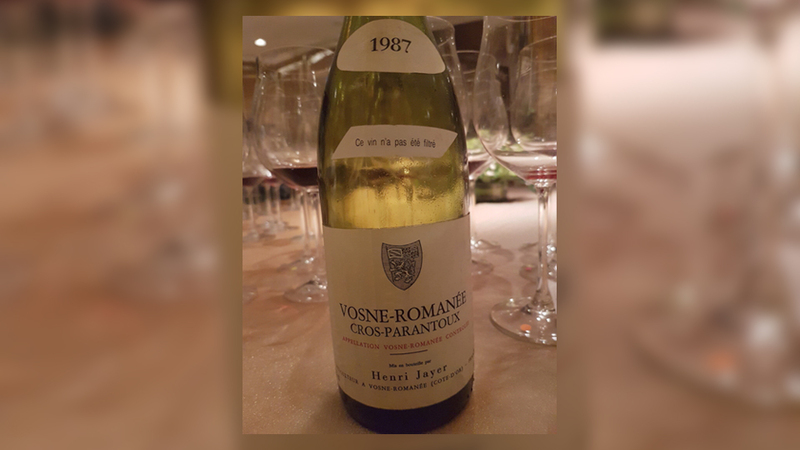 The 1991 Vosne-Romanée Cros-Parantoux 1er Cru has a beautiful bouquet with undergrowth-infused red fruit, crushed stone and pressed rose petals. It demands more coaxing than the 1993 but it repays in terms of its intensity. The palate has exquisite balance, quite powerful, and is a little oakier than the 1993. Yet the 1991 is extremely youthful, with cashmere tannin on the seductive and plush finish. It is a sublime Cros-Parantoux even if the 1993 has more charm. 95/Drink 2018-2030. The recent sale in Switzerland of bottles and magnums inherited by Jayer’s two daughters, along with other Henri Jayer paraphernalia, was a kind of full stop on his career. It represents probably the final time that bottles will be sold with such provenance as the wines are inexorably more elusive and the posthumous mythology surrounding the name will only increase. But Henri Jayer, the man not the legend, was simply a very good winemaker who was ahead of his time.